Home>Editorials>Our Annual Predictions for 2010. Good News and Bad News. Our Annual Predictions for 2010. Good News and Bad News. Will 2010 be a 1930 or, comparable to 1937? Is it different this time? When one nation state of a formerly high productive stature destroys itself with inflation, the untouched others can soften the blow and in time bail out the fallen one. This was Germany’s fate in the 1920’s. In our current instance, most all of the world’s economies are on their knees with some hurting worse than others. Who can help with recovery this time? There is no one. It will not be China as some suppose as China shall suffer the same systemic collapse as the U.S, and all of Europe, Russia, and South America. China’s neighbors Japan, Taiwan, Korea, India, Indonesia and others will join the fallen. The interwoven complexities of international trade and finance have caught them in all in a spider’s web of systemic collapse. Those who can shall attempt a massive inflationary rescue. While it might appear to work for a few months, eventually all implodes. Please note the following from John Pugsley’s “Common Sense Viewpoint” as printed in “Golden Insights” by James U. Blanchard III 1997. We agree with Mr. Pugsley but, this was written years ago. We would suggest that this time with most formerly productive nations becoming victims of both inflation-hyperinflation and systemic collapse; the ending could be much worse than supposed. We forecast inflation first then hyper-inflation some time down the road. What happens between here and there? While in our view, our forecast episodic adventure takes at least 2-3 years but, no one knows for certain. We forecast 2010 to be one of the very worst years of Greater Depression II; the year 2010being the second cycle of several depressionary phases. The fall of Lehman and a surrounding crash was only Phase One. Before Phase Two terrorizes global markets, we suggest a short recovery arrives first. Debts both public and private have not been paid down to any great extent. To make matters worse, new debts continue to plague central banks, nation’s banks, consumers and commerce. In order to find a basing bottom and enable a recovery, these debts must be paid, repudiated or inflated away. For now all of these solutions are in play but as fast as old problems are resolved even more continue to pile-on aggravating the troubles. While global governments are busy attempting to inflate away debts through monetization; i.e., printing piles of un-backed dollars, notes and bonds, the load is simply unsustainable on the math. Manipulators have gone past the point of no return. There will be no recovery until after a smashing correction arrives. This smash is the quick and dirty answer to final de-leveraging of all those debts. We think it comes in phases and in fits and spurts. Japan is in the worst shape with public debt versus GDP now standing at 270%. With an aging population and not nearly enough young workers entering their workplace, deflation arrived again and the Nikkei Stock Market is taking big hits. The U.S. and Europe except for the U.K have 125% of debt versus GDP with the U.K’s at 105%. (Source for percentages Societe Generale). The U. S. Dollar plays a very important role in these problems. With the Dollar being 85% of the entire world’s reserve currency; as the dollar goes, so goes the global system. Unfortunately, the dollar has much further to fall and for this month of December, 2009, the dollar can sink to an index low of 70.00-72.50 from today’s prices. 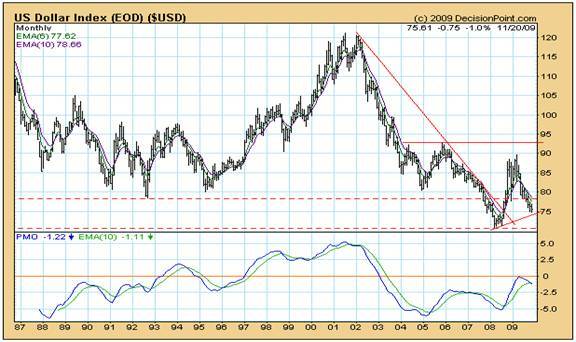 Look for the dollar’s final support as a minimum low sometime during the next three years ranging from 40-46. Stocks are peaky and will shorter term correct. We think the nearby correction will be mild and new buying can return in January, 2010 continuing through spring, 2010. The Dow could easily find an 8850 base and then return to a new rally. The S&P’s might base at 950. Meanwhile, we could experience an 11-12% Dow and S&P haircut. The blow-off top for primary stock markets could be later May through July, 2010. On this cycle, five extremely negative events hit world economies and markets simultaneously. (4) Commercial real estate loans bankrupt many developers and their projects among those existing, under construction, and planned. (5) Insurance companies are holding so much failing commercial real estate paper, they are in danger of defaulting with some running for government bailouts in TARP II. At one time years ago, the 20 top insurance companies could literally control the United States economy. They are huge asset holders of property and cash investments. Housing valuations will fall on the average, nationwide in the U.S., another -30%. We figured about one year ago that 1980’s prices would be the bottom. Now we potentially see a bottom at 1970’s prices. More homes were foreclosed in the last 12 months than in an entire decade in the first Great Depression of the 1930’s. On the Monday morning of 11-23-09, news reported used housing sales were up 10.1%. This is nothing but giveaways prodded by seller financing, government freebie down payment credits, and crash and burn pricing taken by bottom feeders. Housing remains in international collapse. The last great creditor, FHA is hurting badly. Inflation is now an unreported at 7% and rising. By May, 2010, it begins to bite very hard first on the lower 1/3rd of U.S. wage earners and the jobless. Most of their income is spent on food and energy. They top the inflation pain lists. Consumers with newer bought and leased autos will do “jingle mail.” They will return newer unexpired leased cars and trucks back to dealers’ lots, give them the keys and quit paying. We saw this with houses over the past 1-2 years. Auto lots will overflow with new-used cars and trucks. Values will plummet. Many of these “returns” will be from the “Cash for Clunkers” program by those who got stuck with unaffordable car and truck payments. Auto-maker GM projected total U.S. industry sales for 2010 of 11mm with a new recovery. There will be no recovery and sales could skid for the whole industry group down to 7mm or less in 2010. In 2011 it gets even worse. Auto layoffs will escalate and unions will scream for help to president Obama. He will financially band-aid a dying industry. Consumers have no buying power, credit or cash to make any difference. Those with cash will save it and hunker down and wait out the troubles. Auto union membership declines rapidly. Most vehicle lending dries-up to a trickle. The crude oil and energy sector has fundamentals pulling in both directions. Today we see oil price resistance at $80 with a trading range slightly lower in the $70’s. Fundamentals show an over-supply on recession-depression lower demands. On the other hand, inflation of prices is rising on a weaker dollar and will escalate. Look for crude oil to visit the $50’s and then turn-around on inflation rising to $100. Gasoline will follow as some refineries are closing on operating losses and no new ones are being built. Inflation ultimately wins on price escalation. Eventually, scarcity of product returns. Depressions normally and historically last ten years. It could take consumers that long to pay down all of their debts before a return to normal conditions. Savings rates are up but with so much debt and few or zero salary raises in the face of new and rabid inflation, consumers will be economically slaughtered. Credit and banks go through the wringer again. There are few bank ideas left to earn lender income except for trading. While Goldman Sachs makes millions weekly doing this, most banks are not set-up for it and there are only so many good traders available for the work. Since Obama’s compensation guy is rankling big traders with income limits this makes things worse as these people leave for unrestricted pay in overseas trading positions. The bond market is so huge it takes time for it to roll over and slide off a cliff. Asia and the U.S Federal Reserve have been our larger paper buyers. While they still buy some to keep markets glued together they are: (1) exiting the longer term paper for shorter terms and, (2) buying less of it turning to other ideas in the commodity markets. With the higher Yen, Japan is increasingly engaged in hard asset shopping trips as is South Korea. They are both looking for grain, gold, oil, natural gas and other commodities they lack internally. Junk bonds could lose 1/3rd of today’s value just next year. Treasury bond and note buying continues until “full faith and credit” is repudiated on distrust. Eventually they crash but in slow-motion over years due to the magnitude of these markets. We think no bond is a safe bond. Municipal bonds are viewed as some of the safest. What happens when cities, towns, counties and states are so broke they cannot pay the interest? Their tax revenue is going off a cliff. Some are safer than others for awhile but for how long? Who can finger a top? It can’t be done as it’s too political. Various states within the United States have or, will be failing financially. Someone reported 1/3rd of the TARP money spent so far was used to bail-out bankrupt states. This will escalate as federal TARP money cannot help them fast enough and in large enough amounts to keep it all glued together. Watch for fire and police employment to get as thin as too be very dangerous in various communities. Ten states are going financially critical and 47 are on the watch lists. New York, New Jersey, Connecticut, Michigan, Ohio, Florida, Arizona, Nevada and California are among the financially worst, hurting from falling tax revenue on broken businesses and consumers. Watch California as they could go out of control first within this group. They continue to contrive new taxes and not work on spending reduction. When some states face total collapse it will get very ugly very quickly. Michigan is among the worst of the worst. Most all of the states are spending themselves into the ground. They refuse to cut back as its political suicide. They will spend until there is nothing left to spend and then scream for help to the Federal Government. China is in very serious trouble as the U.S. consumers have stopped buying their stuff. Their TARP for early this year exceeded that of the United States in both amount and rapidity of spending. It is estimated they spent in four months from January, 2009 to May, roughly $600 Billion with most of it going into projects now at over-capacity. The U.S.’ lack of buying cut China’s entire year of exports by -25%. Also, note the Chinese economy is 1/4th the size of the United States’ economy. There are hundreds of idle Chinese factories and millions of laid-off workers with no new factory employment and not much work of any kind. Further, millions sold subsistence farms to work in the city. Now that work is gone and so are the farms that would have fed them. Watch for a slow motion or, faster collapse of China with a descent into riots and other social problems in 2010. China need 24mm new jobs each year just to stay even and are remain far behind that job generation power curve; never mind new job growth gains. If the worry of China not buying our treasury paper suddenly became real, the U.S. government could stop most all Chinese exports into the U.S with crushing tariffs. China would then have skyrocketing joblessness, goods piled-up with no sales and be stuck with a trillion dollars in crappy U. S. bond and currency paper having little or no value and no way to sell it. They would take a $1 U.S. Trillion paper hit and be stuck with mountains of un-saleable merchandise. The social fallout would be catastrophic. China shall continue to buy U.S. Bonds to keep exports moving; albeit at a reduced level. Should Chinese imports cease, American workers might find some lower paying employment in re-opened U.S. factories with the return of manufacturing to the states from Asia. After all, where would Wal-mart get all their goods to sell in U. S. stores? We hope for the best and would prefer China keep it all glued together and endure only a mild recession. With global financials and markets so fragile and wrecked we give them a one in five of pulling it off. Rather, in a Chinese communist command economy, forthcoming dislocations could be legendary. Ambrose-Evan Pritchard, the esteemed writer for The London Telegraph says, “The world economy is still skating on thin ice. The west is sated with debt, the East with (too much) plant. The crisis has been contained (masked) by zero rates and a fiscal (credit) blast, trashing sovereign balance sheets. But the core problem remains. The Anglo-sphere and Club Med are tightening belts, yet Asia is not adding enough (internal) demand to compensate. It is adding supply.” (Editor: organic Chinese demand is barely beginning). We agree with Mr. Pritchard but contend China has other bubbles in autos, real estate, their stock market and major water shortages and pollution as well. If these bubbles pop one at a time, it goes easier. But, we might see multiple bubble-popping instead. In that instance, China might take-down the entire global system. Note the effects of the recent scare from Dubai on their $80mm default. Education, particularly among colleges and universities, has hit the money wall as students now debate if a $40,000 to $80,000 expenditure is worth it in this economy. Newly graduated kids with good degrees but no experience go to the end of the line for jobs. Experienced people get what few jobs remain as employers have a wider range of choices and can be super picky. Further, employers have no time or money for training. Many kids are schooling on the internet and with on-the-job training while taking menial work for any kind of a pay check. Public school teachers with longer years of experience, working in grades K-12 are being thinned out for some cheaper new grads. Foreign language teachers along with those in math and science are still preferred over the others. Watch for an increase in home schooling as laid-off teachers with their own children work at home and take in other peoples’ kids for instruction-pay. The big public school systems are in trouble. They can no longer be afforded. Since the U.S. Government layered on piles of bureaurat red tape some years ago, fully 1/3rd of public school budgets must be devoted to stupid, expensive politically correct type work. It’s all a big waste as students and teachers must suffer for it. Watch for more traffic accidents due to postponed road work and repairs. Bridges can fall and broken paving causes more wrecks. Higher tax communities will be abandoned especially by seniors with educated kids out of the house. New York City has lost over $6 Billion in income taxes from those fleeing the city and the state. This trend goes even faster. We see retired folks selling out as local real estate taxes are unaffordable. They are migrating to lower tax states and smaller communities offering fewer services. Much of the big city service stuff is not required and consumers cannot pay for it. Think of Detroit’s city wasteland on steroids. Fund managers and traders are not married to markets and move to ideas that produce. Gold and silver shares can top and correct in the near term but then take-off in new 2010 rallies. Bigger funds have invested in long-only commodities baskets including gold, silver, grain, copper, platinum and others. They regularly buy the whole cycle from Labor Day to May, endure the dips and trade on 50 and 200 day averages. With a falling dollar these managers forecast stronger gains in these markets. December gold futures were trading near $1,200 this morning of December 1. We see a near-term mild correction followed by more buying. The Obama left wing liberal agenda designed to transfer wealth is not working. The president’s popularity is sinking along with his agenda. The primary problem is the administrations inability to claw out of the employment depression. Instead, they will continue to keep digging while installing the wrong ideas, creating more and deeper messes. This advances the desirability of precious metals, and other hard assets of all kinds. Joblessness is the primary economic problem. Dollar is the key to several markets. For December, dollar sinks lower. Never mind the angled line support. Look at the lower box momentum. Personally, I can see unbelievable opportunities to trade that we would never see again for many years. Turn these problems into opportunities. Those on the right side of the trade might get rich. Those on the other side are just victims. Stay Alert. –Traderrog. Roger Wiegand is Editor of Trader Tracks Newsletter and of the Rog Blog at www.webeatthestreet.com. Roger provides recommendations for short and longer term trading using stocks, futures and commodities with specifics. Roger Wiegand is the Editor and co-partner of Trader Tracks. He alone is responsible for all writing, editing and content. Roger's publisher is Taylor Hard Money Advisors, Inc (THMA) in New York City. Roger Wiegand found and put together his first real estate-mining joint venture with his real estate developer employer in the early 1970's with a USA national, public gravel miner.